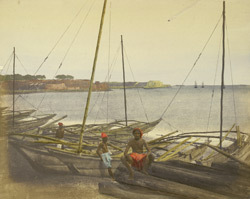 bl.uk > Online Gallery Home	> Online exhibitions	> Asia, Pacific and Africa Collections	> Beach of Colombo, Ceylon. Photograph by Frederick Fiebig from an album of 70 handcoloured salt prints, of the beach at Colombo in Sri Lanka (Ceylon). Fiebig, of German origin, was active in Calcutta as an artist and lithographer in the 1840s. Little is known about his life, but turning to photography in the late 1840s he produced hundreds of photographs by the calotype process, frequently handcolouring them. His photographs of Ceylon, probably taken in 1852, are considered the earliest surviving photographic record of the island. The capital of Sri Lanka, Colombo is a major commercial centre and port on the western coast of the island. It had long been a significant port for Arab traders, frequented in medieval times by vessels from the Persian Gulf, China and other Asian countries. From the 16th century, it evolved under various European powers, the Portuguese, the Dutch and the British. The modern metropolis and harbour were developed under British rule.